It’s Hall of Fame voting season for Major League Baseball, and I’ve officially cast my ballot. Are you surprised to hear that I have a say in who enters the Baseball Hall of Fame? Well technically I don’t. I cast my vote as a member of the Internet Baseball Writers Association of America. The Baseball Writers Association of America (BBWAA) is the actual group that votes and determines who enters Cooperstown. The BBWAA is made up of writers that cover baseball for “traditional” mainstream media publications that meet the qualifications of the BBWAA constitution and thus have been granted credentials by Major League Baseball. The Metssiah falls short of the necessary qualifications to join the BBWAA. However, the Internet Baseball Writers Association of America is an awesome alternative for bloggers like me, and it is made up of some of the most talented internet writers in the game. The IBWAA votes every December for its Baseball Hall of Fame and the rules are very similar to those of the BBWAA. A player requires 75% of the vote to be elected into the Hall of Fame by the IBWAA and the main difference is IBWAA voters can select up to 15 candidates on their ballot. The 10 player voting limit imposed by the BBWAA doesn’t make much sense to me and in a year like this where the ballot is stacked, it leads to some Hall-worthy former players missing out on needed votes. I voted for 12 players on the 2017 ballot, and I will outline my voting rationale in two separate posts. This post will focus on the players I voted for that were linked to steroid allegations or other character issues. The next post will focus on the remaining players that I included on my ballot. Before I dive into the juiceheads and jerks, I should note two things. The first thing is that Jeff Bagwell, Tim Raines, and Edgar Martinez have already been elected into the IBWAA Hall of Fame, and therefore they have been omitted from the IBWAA HOF ballot. That being said, if they were on the ballot I’d be voting for all three of them. Bagwell has the sixth ranked all-time WAR (79.6) for first baseman. Tim Raines ended his career with 2605 hits (80th ranked), 808 stolen bases (5th ranked), 1,330 walks (38th ranked), and a .294/.385/.425 slash line. Edgar Martinez faces the DH bias, but he slashed .312/.418/.515 with 2,247 hits. His .933 OPS ranks 33rd all-time. 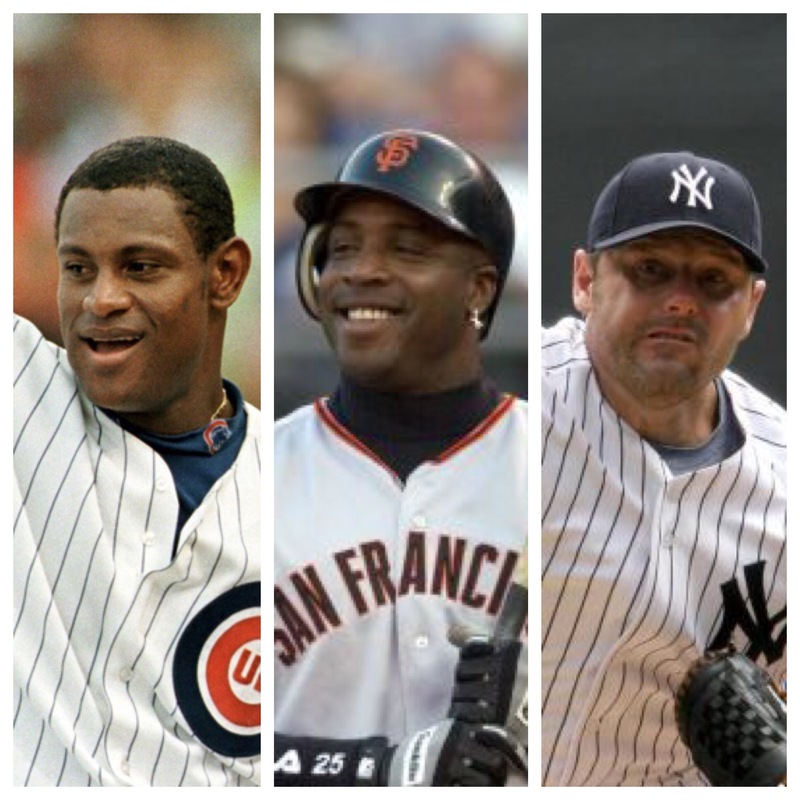 The second thing I need to preface this post with is my position on the steroid era. Ultimately, I did not feel that the steroid allegations against the players I voted for below warranted disqualifying them from the Hall of Fame. I didn’t hold alleged steroid use against this crop of players because Major League Baseball has failed to take an actual stance on the steroid era or provide any useful guidance on the subject. If MLB had hypothetically engaged an independent party to 1) identify a set time period that qualified as the steroid era (i.e. before formal testing protocols), 2) conduct separate “character investigations” for each HOF eligible individual and then 3) based on those investigations classify individuals as eligible or ineligible, then perhaps we wouldn’t be in this situation where every writer has a different view and there’s absolutely no consistency in the character determination whatsoever. This group of players primarily competed before the modern steroid testing protocols were put in place, and other than Manny Ramirez, these players never tested positive under the league’s formal program implemented in 2005. I also feel that the current penalties under the league’s Joint Drug Prevention and Treatment Program represent the only real stance MLB has taken on the subject of steroids. Right now the league has a three strikes and you’re out policy. I think if the league is willing to forgive and welcome back players that have been suspended for using performance enhancing drugs, then I am willing to take a similar stance in my Hall of Fame voting approach. Barry Bonds is number 4 all time in WAR (162.4) and number 2 for position players. Bonds won 7 MVP awards. He was 4th in OPS (1.051), 3rd in runs scored (2,227), number 1 in homers (762) and walks (2,558). A debate about whether or not he’s the best player of all time could be fun and interesting. But there is no Hall of Fame debate. He’s the GOAT. Roger Clemens is in the same boat as Barry. He won 7 Cy Young awards and 1 MVP. He’s number 8 all time in WAR (140.3) and 3rd for pitchers. His 354 wins rank 9th all time and his 4,672 Ks rank 3rd. He’s undoubtedly had a HOF career. Ivan Rodriguez won 13 Gold Gloves and is considered one of the best defensive backstops in the history of baseball. He also won an MVP award. He hit .296/.334/.464 with 2,844 hits, 572 doubles, 311 home runs, and 1,332 RBI. He ranks 1st for a catcher in both hits (2,749) and games caught (2,377). His 304 home runs as a catcher rank third behind Mike Piazza and Carlton Fisk who are both in the Hall of Fame. Pudge is an unequivocal first ballot Hall of Famer. Manny Ramirez was the lone player on my ballot that tested positive for banned substances (2009 and 2011) after MLB rolled out its testing protocol in 2005. Almost all of his production came before his positive test at 37 years old, and I’m not willing to disqualify him based on the positive tests at the end of his career. Manny Ramirez hit 555 home runs (15th ranked), had 2,574 hits, 1,831 RBIs (18th ranked) and a career slash line of .312/.411/.585. His .996 OPS is 8th all time. He ranks 72nd in WAR for position players (69.2) and 32nd for offensive WAR (81.2). His list of top 10 player comps on Baseball Reference includes five hall of famers and five players who will likely be in the Hall someday. Manny’s numbers are Hall-worthy. Sammy Sosa hit 609 career home runs, had 2,408 hits, 1,667 RBIs, and a career slash line of .273/.344/.534. He ranks 8th on the all time home run list. His poor career defense in right field really drags down his overall value as a player, but his slugging prime from 1998 to 2002 was representative of a Hall of Fame talent. He cranked 292 dingers in 5 years. His top 10 player comp list includes eight players currently in the Hall of Fame and two players that may one day wind up in the Hall as well. Sammy hasn’t even come close to election in four years on the ballot, but I truly believe that if the writers were evaluating his career based on the numbers he’d be in Cooperstown already despite his poor defense. Gary Sheffield hit 509 home runs, had 2,689 hits, 1,676 RBIs, and a career slash line of .292/.393/.514. He ranks 117th all time for position player WAR (60.3) and his offensive WAR (79.9) ranks 35th all time. His .907 OPS ranks 58th all time. He ranks 26th in homers, 28th in RBIs, and 39th in runs scored. He walked (1,475) more than he struck out (1,171). His top 10 player comp list has eight Hall of Famers and two possible future Hall of Famers. The advanced metrics reflect that he was a poor defender, but his bat was prolific enough to put him in the Hall. Curt Schilling had 216 career wins (ranked 85th), a 3.46 ERA, and 3,116 Ks (ranked 15th). His 4.38 K/BB ratio is 3rd all time. His 80.7 career pitcher WAR (80.7) ranks 26th all time. He won the Cy Young four times including an award in the AL on the Red Sox. He won the World Series with the D-backs and Red Sox. He formed arguably the most dynamic pitching tandem in baseball history with Randy Johnson. He was a dominant playoff performer with a 2.23 ERA in 133.1 innings pitched. His record is worthy of the Hall of Fame. Unfortunately, Curt Schilling has demonstrated that he’s a deplorable human being in his post-playing career. He’s made jokes about lynching reporters, and he’s shared hate filled views and chalked them up to politics. All that being said, I think his numbers reflect a HOF baseball career, and I personally find it hard to deny him entry solely based on his offensive and misguided social views. Obviously the Hall of Fame voting process is subjective and every writer has a different view on which stats make a player Hall-worthy. But I think the character clause is one area where Major League Baseball owes it to the IBWAA, the BBWAA, the players and all the fans to provide detailed voting guidance. If MLB wants to take a strong stance against steroid use, gambling, potentially racist “political views” or any other character issue, then the league should clearly outline their policy in these areas in the context of the Hall of Fame character clause. Staying silent is a gutless move by the league and negatively affects everyone involved in the process.